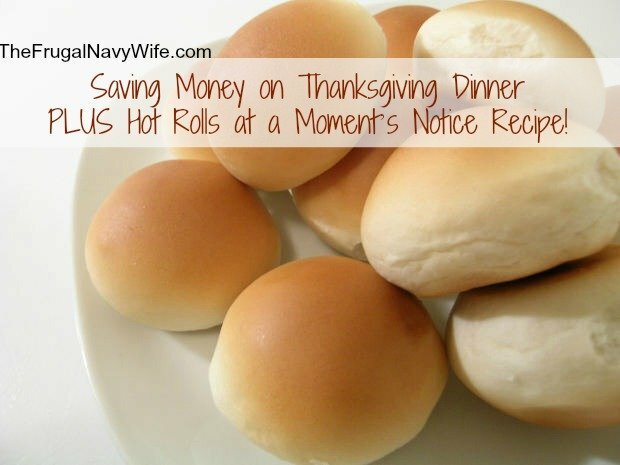 Saving Money on Thanksgiving Dinner + Hot Rolls at a Moment’s Notice Recipe! You Are Here >> Home » Easy Meals » Baking » Saving Money on Thanksgiving Dinner + Hot Rolls at a Moment’s Notice Recipe! After Thanksgiving stock up on items that you will need for the next holiday. Each year I buy things on clearance for the next year's holiday. Place them in a box marked Thanksgiving and you will be set. Cook as much as you can from scratch and plan your menu in advance so you know what you will need. Plan your menu around things you like to have on Thanksgiving and stick with your list. After you have your menu ask family members to bring a side dish add well to cut down on your out of pocket expenses. This way you aren't spending all of the money out of your own pocket, you are cutting out a little bit of work and keeping from getting duplicates. Hot rolls can be made from scratch with this easy recipe from my grandma. Combine all three and set aside. Measure these ingredients into a large bowl. 2 cups warm water, 12 Teaspoons melted shortening, 2 teaspoons salt, 4 cups flour then add 2 egg whites or 1 whole egg. Beat for 2 minutes then use your three ingredients from the first step and mix them together with the dough. You want to mix well but not beat, then add 4 more cups of flour. Knead the dough just enough to handle without sticking to your hands. Add more flour if needed. Then grease the top of your dough, cover well and refrigerate. Work down in an hour and return it to the fridge and knead as needed. When you are ready to use your bread dough, punch it down and cut off dough about 2 hours before baking. Shape into hot roll shape, place in pans and let them rise until they double in size. When they are ready to be baked bake at 425° F for 10-15 or until brown. Serve with butter, jelly or your other favorite topping! But if you prefer frozen they can be bought with coupons and on sale to maximize your savings. Turkey is a must have on our table and I try to buy them when they are less than $1 a pound. Often times they are on sale for less or sometimes you can get lucky and get a free turkey with a purchase of a ham or vice versa. Just put the ham in the freezer until Christmas time. Enlist the kids to help with decorations to make things like turkey hands or feet. Search Pinterest for even more great craft ideas that will be a hit with them no matter what your age group of children you have. You could even have a craft station set up with fun activities that the kids can complete that day to get a jump start on the holidays if you wish. If you are going to have alcohol make sure you ask guests to BYOB (Bring Your Own Beverage). This way you don't have to spend extra money and guests can drink what they prefer. Then there is a variety available which we always tend to enjoy!! How else do you save on Thanksgiving dinner?